Looking to refresh your home decor or renovate? Building a new home or just want to tweak your accents? Take a look at the best Home Trends for 2018 in Design and Decor straight from the trend list on Pinterest! 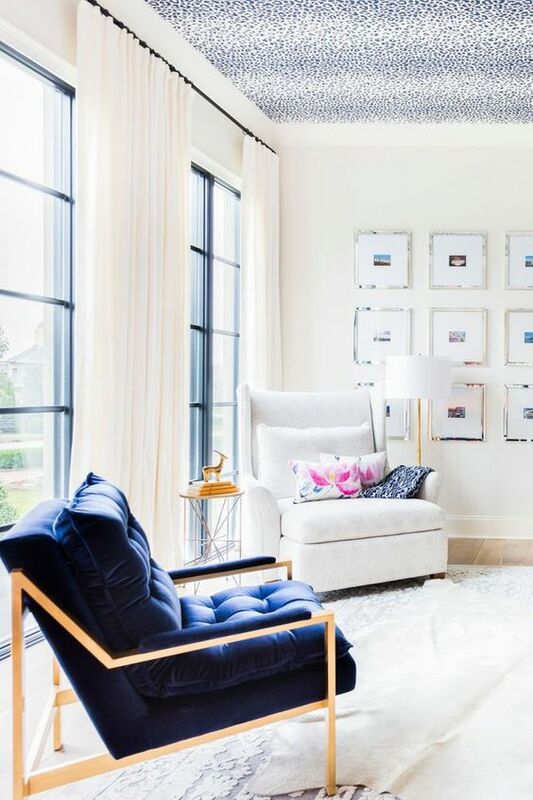 Pinterest has released it’s fourth annual top 100 trends for 2018, and the decor list is defined by both bold color and neutral minimalistic details. Terrazzo is made from pieces of marble, quartz, granite and glass. 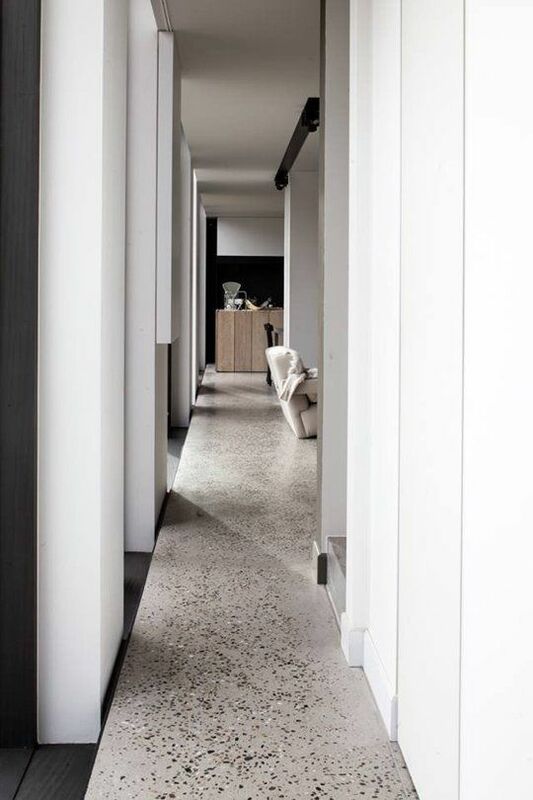 Terrazzo tile and flooring is a fresh way to add a natural stone look in place of marble. Perfect for entryways and kitchen flooring. When used as home decor the pattern gives a modern abstract touch to your space. CLICK ON THE IMAGES BELOW TO SHOP EACH ITEM! Large scale art is new and now. Which is fabulous and much less time consuming than putting up a gallery wall! Turn your bathroom into a spa with fluffy white towels, a tub tray, candles and scented bath salts! 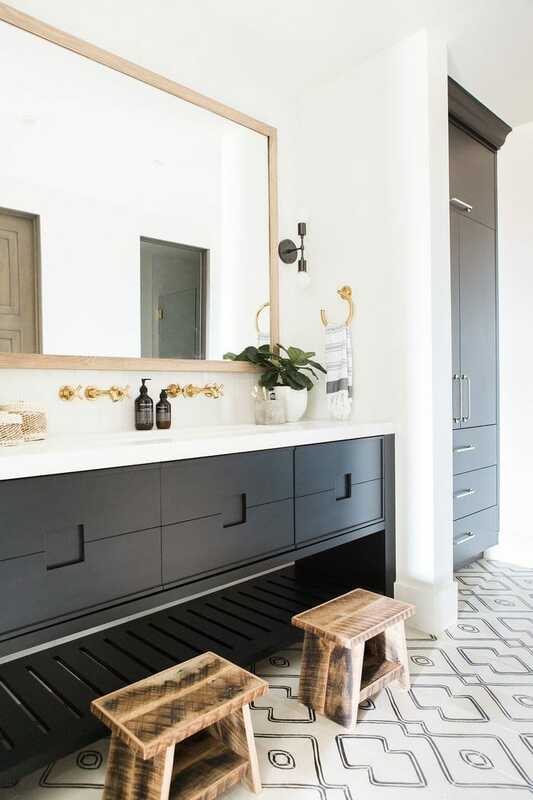 Relaxing from the daily grind with a blissful bathroom is a big trend for 2018. 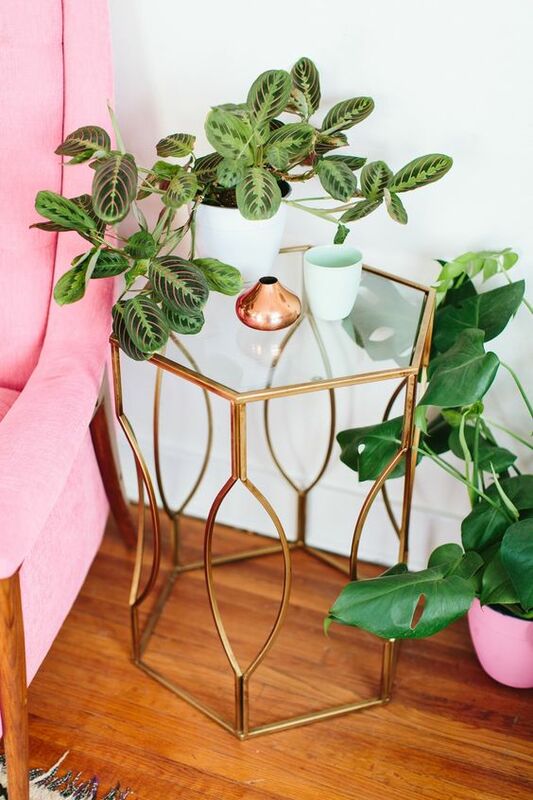 Patterned plants like this prayer plant are hot for 2018! Look for tropical plants that have striped or dotted leaves to update your home in a jiffy! Timeless and classic herringbone wood floors add a high value to a home’s resale price and add a complete wow factor! A herringbone marble backsplash in the kitchen or fireplace tile surround is another way to add this beautiful staggered pattern to a home. The intricate handmade art of bone inlay furniture and decor gives a space a shot of pattern without going too bold. Colourful front doors and door mats with friendly quotes is he New way to add curb appeal to your home and welcome guests. 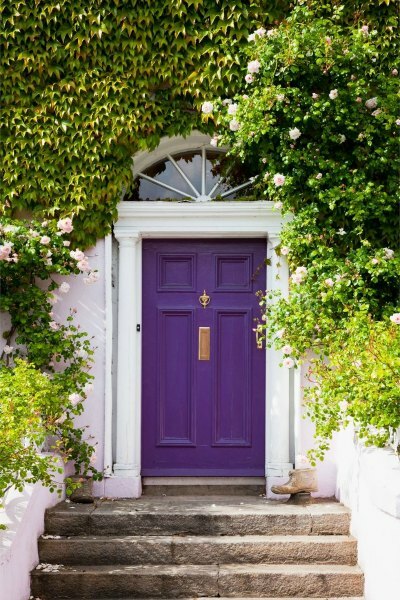 See How To Decorate With Color Of The Year Pantone Ultra Violet! Stay away from matchy matchy and add a mixture of metal finishes to your bathroom and kitchen! 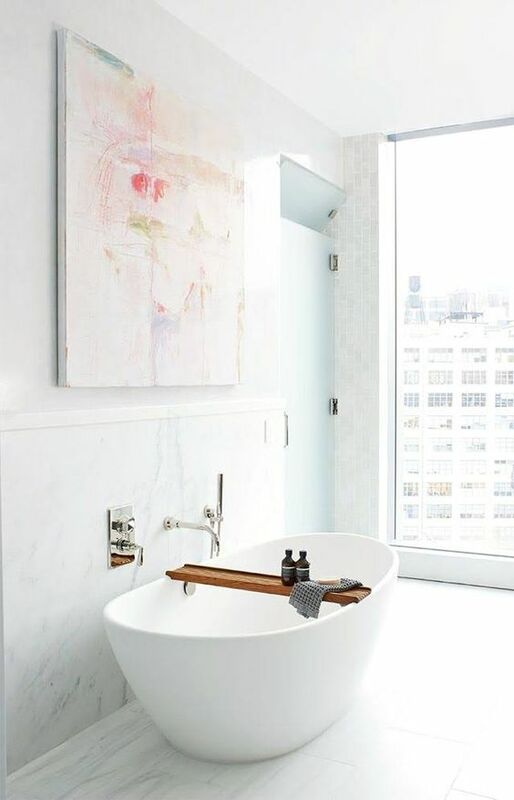 This bath combines gold, bronze and silver finishes for a beautiful interesting look! This is a Mix of Scandinavian minimalism and Japanese zen – it’s the elimination of tech stimulus and incorporating air sea and nature into the home. Overall the trends I’m really loving are the oversized art trend, herringbone tile, mixed metallics and the Peace Out trend! What do you think about these Home Trends for 2018 in Design and Decor? Which do you think you might use in your home this year? 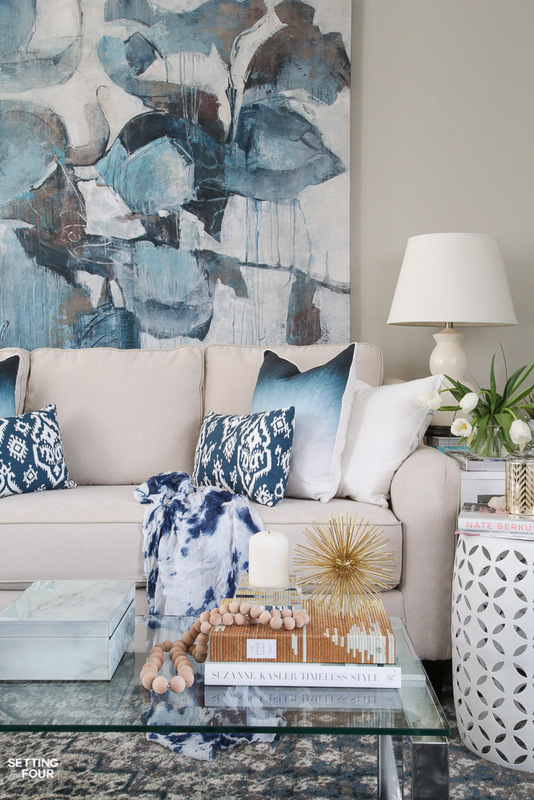 5 TIPS TO DECORATE ACCENT TABLES LIKE A PRO! Great list! 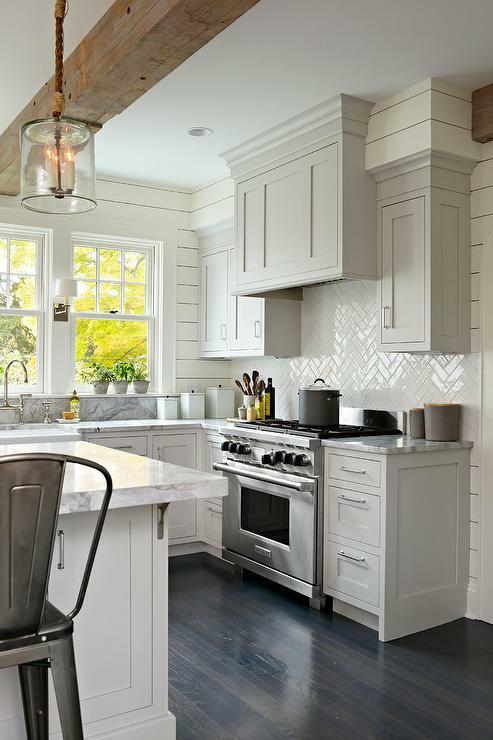 I love the herringbone pattern so much, and especially the kitchen that you showed! I have my subway tile in the normal pattern in my kitchen but in the herringbone pattern just over the stove. I also like the statement ceilings as long as they aren’t distracting. The mixed metals make my life so much easier because when you have lived in a house for 19 years, you slowly replace things and it’s nice not having to worry about matching! I wholeheartedly agree with everything you said Shelley!!!! 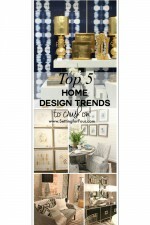 I’m glad you have some of these trends in your home already! !Thank you so much for commenting! Great post, Heather! I’ve been excited to see the new trends for 2018 and love most, but I’m not sold on the patterned ceiling yet :). I’m glad you like this post!! I’m not sold on that trend either lol! Hi Heather…I just subscribed to your website and am excited to look at everything. So far I am very impressed. I have a question regarding the oversized artwork. Did you buy the artwork that big, or did you get a picture “blown up”? I have a few beautiful pictures and wondered if I wanted a small picture blown up, where does one take it? And I also wonder if it loses its appeal from being “stretched” (didn’t know what else to call it) to a larger size? Maybe the enlargement techniques are different nowadays? Another question is regarding paint. We are in the process of building our new home and I want to paint the walls white. My flooring is quite dark, cabinets dark. I got a couple of sample jars of paint..Bm Super White and Simply White. I’m more drawn to the warmer Simply white, but I am going to put some black accents in the house (patio doors painted black, interior transom window trims black, pantry door black and office doors black. (Picture clean and crisp tuxedo) I’m so afraid that the simply white will just look too yellow and super white too stark. Any suggestions? Thank you! Hello Colleen! Thank you for subscribing and your compliments on my site! I bought that artwork at HomeGoods. You can get photos enlarged and put on canvas online – I would just google canvas art from photo and research it. 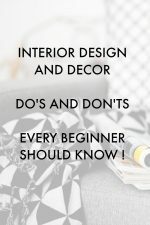 I do offer online decorating advice and color consults! Email me at settingforfour.com and I can definitely tell you which white to use! Have a wonderful day! 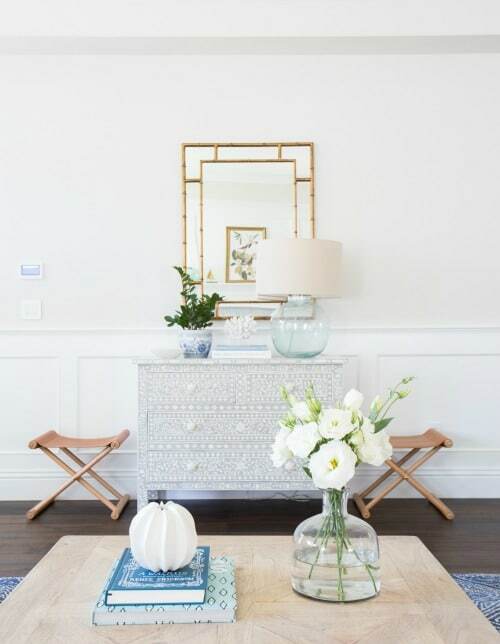 WOW I adore your style and decorating! Especially your kitchen, we just decided to do shiplap on the walls in our kitchen as well and I am looking for inspo pics and came across your blog on Pinterest, just wanted to say I love your style and definitely using your pics as inspiration, thank you and keep it up, you have gorgeous style and amazing taste!!!! 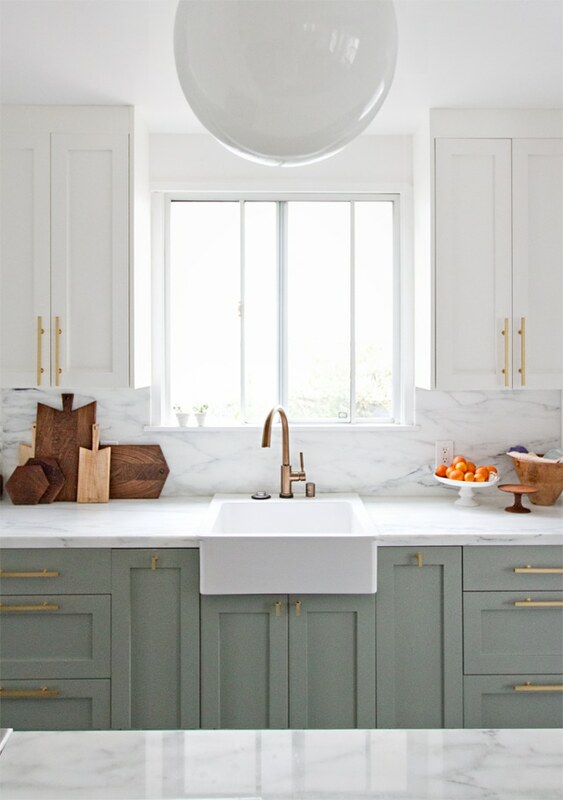 I love the white herringbone in the kitchen photo! I’m trying to find it. Do you know where I can purchase? Thanks so much!